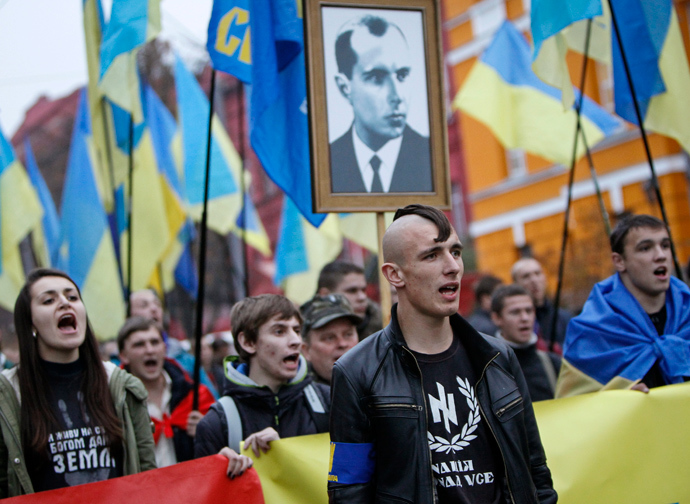 The U.S. has Installed a Neo-Nazi Government in Ukraine. - Upstate Berserkers vs "Gray Cardinals".... | Upstate Berserkers vs "Gray Cardinals"…. « Is joining the European Union, Estonia has made ​​life better or worse? The U.S. has Installed a Neo-Nazi Government in Ukraine. May 28th, 2014 by berserker | Posted in Out of Bounds ! “Flowering Democracy, Revolution”? The grim realities are otherwise. What is a stake is a US-EU-NATO sponsored coup d’Etat in blatant violation of international law. The forbidden truth is that the West has engineered –through a carefully staged covert operation– the formation of a proxy regime integrated by Neo-Nazis. The Western media has casually avoided to analyze the composition and ideological underpinnings of the government coalition. The word “Neo-Nazi” is a taboo. It has been excluded from the dictionary of mainstream media commentary. It will not appear in the pages of the New York Times, the Washington Post or The Independent. Journalists have been instructed not to use the term “Neo-Nazi” to designate Svoboda and the Right Sector. We are not dealing with a transitional government in which Neo-Nazi elements integrate the fringe of the coalition, formally led by the Fatherland party. The Cabinet is not only integrated by the Svoboda and Right Sector (not to mention former members of defunct fascist UNA-UNSO), the two main Neo-Nazi entities have been entrusted with key positions which grant them de facto control over the Armed Forces, Police, Justice and National Security. While Yatsenuyk’s Fatherland Party controls the majority of portfolios and Svoboda Neo-Nazi leader Oleh Tyahnybok was not granted a major cabinet post (apparently at the request of assistant Secretary of State Victoria Nuland), members of Svoboda and the Right Sector occupy key positions in the areas of Defense, Law Enforcement, Education and Economic Affairs. 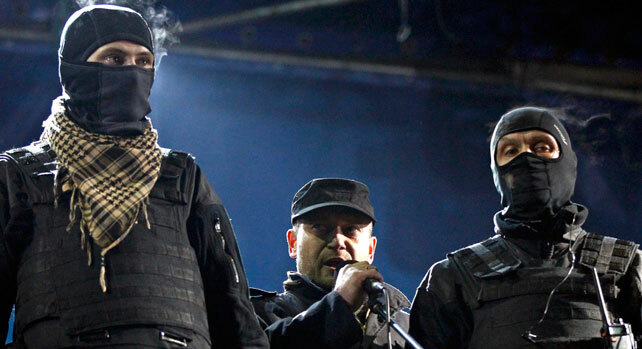 Andriy Parubiy [right] co-founder of the Neo-Nazi Social-National Party of Ukraine (subsequently renamed Svoboda) was appointed Secretary of the National Security and National Defense Committee (RNBOU). (Рада національної безпеки і оборони України), a key position which overseas the Ministry of Defense, the Armed Forces, Law Enforcement, National Security and Intelligence. The RNBOU is central decision-making body. While it is formally headed by the president, it is run by the Secretariat with a staff of 180 people including defense, intelligence and national security experts. Parubiy was one of the main leaders behind the Orange Revolution in 2004. His organization was funded by the West. He is referred to by the Western media as the “kommandant” of the EuroMaidan movement. Andriy Parubiy together with party leader Oleh Tyahnybok is a follower of Ukrainian Nazi Stepan Bandera, who collaborated in the mass murderer of Jews and Poles during World War II. In turn, Dmytro Yarosh, leader of the Right Sector delegation in the parliament, has been appointed Parubiy’s deputy Secretary of the RNBOU. Yarosh was the leader of the Brown Shirt Neo-Nazi paramilitary during the EuroMaidan “protest” movement. He has called for disbanding the Party of the regions and the Communist Party. The Neo Nazi party also controls the judicial process with the appointment of Oleh Makhnitsky of the Svoboda party to the position of prosecutor-general of Ukraine. What kind of justice will prevail with a reknown Neo-Nazi in charge of the Prosecutor’s Office of Ukraine? “Tetyana Chernovol, portrayed in the Western press as a crusading investigative journalist without reference to her past involvement in the anti-Semitic UNA-UNSO, was named chair of the government’s anti-corruption committee. Dmytro Bulatov, known for his alleged kidnapping by police, but also with UNA-UNSO connections, was appointed minister of youth and sports. The Lustration Committee is to organize the Neo-Nazi witch-hunt against all opponents of the new Neo-Nazi regime. The targets of the lustration campaign are people in positions of authority within the civil service, regional and municipal governments, education, research, etc. The term lustration refers to the “mass disqualification” of people associated with the former government. It also has racial overtones. It will in all likelihood be directed against Communists, Russians and members of the Jewish community. It is important to reflect on the fact that the West, formally committed to democratic values, has not only spearheaded the demise of an elected president, it has instated a political regime integrated by Neo-Nazis. 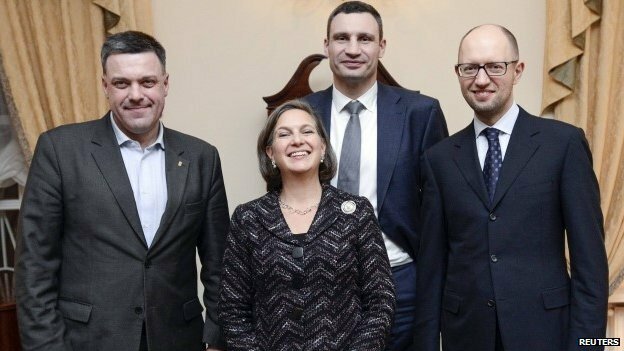 This is a proxy government which enables the US, NATO and the EU to interfere in Ukraine’s internal affairs and dismantle its bilateral relations with the Russian Federation. It should be understood, however, that the Neo-Nazis do not ultimately call the shots. The composition of the Cabinet broadly coincides with U.S. Assistant Secretary of State Victoria Nuland ” recommendations” contained in the leaked telephone call to the U.S. ambassador to Ukraine. Washington has chosen to spearhead Neo-Nazis into positions of authority. Under a “regime of indirect rule”, however, they take their orders on crucial military and foreign policy issues –including the deployment of troops directed against the Russian federation– from the the US State Department, the Pentagon and NATO. The World is at a dangerous crossroads: The structures and composition of this proxy government installed by the West do not favor dialogue with the Russian government and military. A scenario of military escalation leading to confrontation of Russia and NATO is a distinct possibility. The Ukraine’s National Security and National Defense Committee (RNBOU) which is controlled by Neo-Nazis plays a central role in military affairs. In the confrontation with Moscow, decisions taken by the RNBOU headed by Neo-Nazi Parubiy and his brown Shirt deputy Dmytro Yarosh –in consultation with Washington and Brussels– could potentially have devastating consequences. However, it goes without saying that “support” to the formation of a Neo-Nazi government does not in any way imply the development of “fascist tendencies” within the White House, the State Department and the US Congress. “The flowering of democracy” in Ukraine –to use the words of the New York Times– is endorsed by Republicans and Democrats. It’s a bipartisan project. 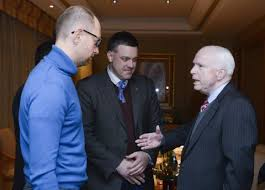 Lest we forget, Senator John McCain is a firm supporter and friend of Neo Nazi Svoboda leader Oleh Tyahnybok (Image right).